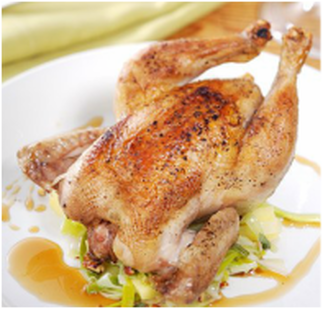 I was searching for new recipes that I could add PURE LUCK (vanilla bean infused salt to) and I found this amazing dish, courtesy of Martha Stewart: "Maple Cornish Game Hen." -PURE LUCK SALTOPIA Artisan Infused Sea Salt to taste (note the original recipe just used salt, but PURE LUCK rocks this recipe)!! Place all ingredients in a medium saucepan over medium heat. Bring to a boil, then reduce heat to a simmer; cook until mixture coats the back of a spoon, about 10 minutes. Strain mixture through a fine mesh sieve, discarding any solids, and finish slow roasted Cornish Game Hen with the sauce, keep on the side for adding sauce throughout the meal.